Spending to date on port security has lagged behind what is needed, according to the American Association of Port Authorities. The federal government has been distributing grants, but it has fallen short of what the ports have asked for. The government is about to release a fourth round of grants. The Coast Guard estimates that necessary port security improvements will cost more than $1.1 billion this year. The Houston Port Authority last month joined a growing list of upgraded ports by opening a new coordination center. The security of the nation's ports is shifting from chain link fences and barbed wire to computers and other high-tech solutions as more ports modernize their facilities to counter the threat of terrorist attacks. The Houston Port Authority last month joined a growing list of upgraded ports when it opened a new coordination center equipped with communications and data-sharing systems that enable port authority police to exchange information with the Coast Guard and local, state and federal regulatory and law enforcement agencies. BAE Systems Integrated Defense Solutions Inc., one of the prime contractors on the $4.4 million project, converted an old communications building into a modern command and control center at the world's sixth largest port. Officials said the project is part of a larger effort to strengthen security and disaster response capabilities both in the port and in the surrounding communities. "Like all ports, [Houston] had to face up to new threats," said Paul Clark, vice president of homeland security at BAE Systems Plc. With improvements in aviation security under way, government officials appear ready to focus more attention on port security, industry officials said. [IMGCAP(2)]At the same time, lobbyists for the port authorities are pressuring lawmakers to increase funding for port security grants. Consequently, many industry officials believe the market for port security is poised for significant growth and will present integrators and specialized technology vendors with many new opportunities. "This is an area that hasn't really reached maturity yet because of the lack of government emphasis and the focus on the aviation industry," said Mark Shaheen, vice president and expert on counterterrorism and national security at the Civitas Group LLC, a Washington advisory and investment services firm. Government and private-sector organizations will spend $6.9 billion on port security over the next five years, the Civitas Group said in a June report. "It's inevitable that the security of ports will have to be enhanced, and it still has a long way to go," Clark said. "The work will be out there, and we have to be patient, and watch the market and seize the opportunities." Following the Sept. 11 terrorist attacks, government officials directed much of their attention toward securing the nation's aviation facilities. Officials now are eyeing other areas of vulnerability, including the country's more than 350 ports that handle more than 20,000 shipping containers daily and 2 billion tons of domestic and international freight annually. 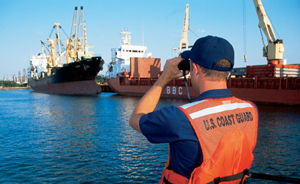 In June 2003, the Homeland Security Department announced new port security initiatives and investments to promote more international cooperation, greater use of technology and additional funds to protect the nation's ports. Previously, port security efforts consisted mainly of physical elements, such as erecting fences. Now some technologies that have matured over the last few years -- such as biometric identifiers for controlled access, explosive screening devices and sensor technologies -- are in use. In five to seven years, ports will deploy security solutions incorporating technologies that are in research and development stages, such as nanotechnologies to detect explosives and smart video cameras that can identify patterns, Shaheen said. A major opportunity will be integrating technologies such as video surveillance, sonar and radar, the Civitas Group said. Ports also will need faster and better container screening processing by radiation and container-security tracking and locking systems. Large systems integrators and other companies that specialize in port security technologies stand to gain from the shift to integrated security technologies, industry officials said. "Security integrators have access to a variety of means through partnerships and acquisitions, and have experience in providing packages of integrated technology," Shaheen said. For example, Science Applications International Corp. is upgrading the Port of Miami's security gate facilities and network communication and integration system. The company is providing an integrated security system that is made up of gamma-ray scanning for vehicle and cargo inspection systems; vehicle identification technology with advanced digital video and optical character recognition components; weigh scales; and driver transaction technology with card readers, a voice over IP camera, microphone and speaker units, and other transaction processing technologies. Smaller local companies also will get a piece of the action, said Terry Gibson, vice president of corporate development for security and transportation technology business unit at SAIC. "The port community looks to small, flexible and innovative companies that can customize what's needed for local requirements," Gibson said. SAIC has a team of operations people, technologists and scientists that meets with various port authorities to discuss potential threats, Gibson said. Other companies, too, are building relationships with port authorities to help them identify security requirements. "We're listening to what the needs of the ports are and the best solutions to help ports address their needs," said Justin Russell, Anteon International Corp.'s director of port security. Most port authorities depend heavily on federal grants for their security projects. For example, half the funding for the Houston Port Authority's $4.4 million coordination center came from federal grants. To date, the Houston Port Authority has received $15.2 million in federal port security grants, including funds from the Transportation Security Administration, U.S. Maritime Administration and the Homeland Security Department's Office of Domestic Preparedness. Besides BAE, other contractors that worked on modernizing Houston's port include Black and Veatch Special Projects Corp. of Overland Park, Kan., Raytheon Co. of Lexington, Mass., and State Construction L.P. of Houston. The Coast Guard estimates that needed port security improvements will cost more than $1.1 billion this year. Since the terrorist attacks, the Department of Homeland Security has issued three rounds of port security grants from the Transportation Security Administration, totaling $516 million under the Port Security Grant Program, an amount that includes $75 million from DHS' Office of Domestic Preparedness. The grants are to help ports comply with new security regulations and to finance security infrastructure projects. TSA is expected to release another round of funding at just under $50 million this month. Still, some lawmakers and interest groups said more substantial funding is needed. Last month, Sen. Patty Murray, D-Wash., a member of the Senate Appropriations Homeland Security subcommittee, introduced an amendment to increase port security grants to $500 million, but the Senate Budget Committee rejected it. The American Association of Port Authorities, an industry group in Alexandria, Va., asked Rep. Harold Rogers, R-Ky., chairman of the homeland security subcommittee of the House Committee on Appropriations, for $400 million for the port security grant program in fiscal 2005. The Port Security Council of America, an organization that represents the homeland security concerns of the U.S. maritime industry, repeated that call. "We are asking Congress for $400 million in fiscal 2005 grant funds, an amount that appears substantial but still is only a fraction of what is needed," said Jay Grant, a Washington lobbyist and director of the Port Security Council of America, when the organization was formed in May. Port security issues must be a priority, Grant said. "Over the next several years, it will take billions of dollars to insure that our commerce and cruise industries are as safe as possible."